Experience lavish lifestyles in our apartments, we at Teerth Realties construct apartments which are way beyond the horizon of today’s architecture. Teerth Towers is here which can convert your dreams into reality; Teerth Towers is one of the leading projects we have constructed. It has several luxurious amenities that can give you the peace of mind. All our projects are constructed according to international standards; this is where we rank ahead than our competitors in the market as there is no brand available that has the capacity to provide features like us. Civil works are created as per IS standards which are best in class. Earthquake resistant construction ensures you to be safe; we have given special preferences to safety parameters of the construction. Automatic elevators will transport you quickly to the required floor; this can educe the stress that you might go through when climbing floors. Intercom option with video facility is provided so that you know your visitors in and out. Security guards have been appointed which have undergone years of training. This maximizes the security approach. Provision for inverter has been made so that you are never out of electricity. Use of modular switches has been done so that you get the best results in electrification of gadgets. 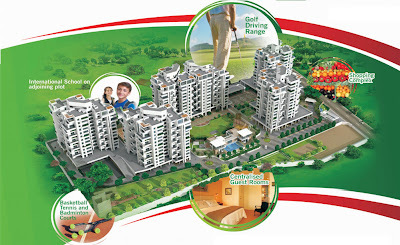 These are some of the features of our construction which have been dwelt inside Teerth Towers. Feel free to log on to http://www.teerthrealties.com for more information on Property in Baner, the website has been updated with details that can surely provide a better picture of our construction projects. 6 towers amidst the luxury of 1,00,000 sq.ft. of open spaces. Jogging track around the complex. Also, Golf Driving Range, Cricket Net Practice, Basket Ball, Badminton & Tennis Courts, Skating Track & Swimming Pool. Technospace’s key highlight is its location in Baner, Pune’s most sought after IT Hub which is also Pune’s premium locale surrounded by the best of hospitals, schools, residential complexes, malls and hotels. Teerth offers you an unmatched view of nature with spaciously designed quality homes sharing close proximity to Pune’s prime locations. And all this at an affordable price. We would be delighted to welcome you to join us in the festive celebration.